Twenty-four students from our business, marketing, culinary arts and hospitality programs made us proud in a DECA competition Jan. 10th at Merrimack College. 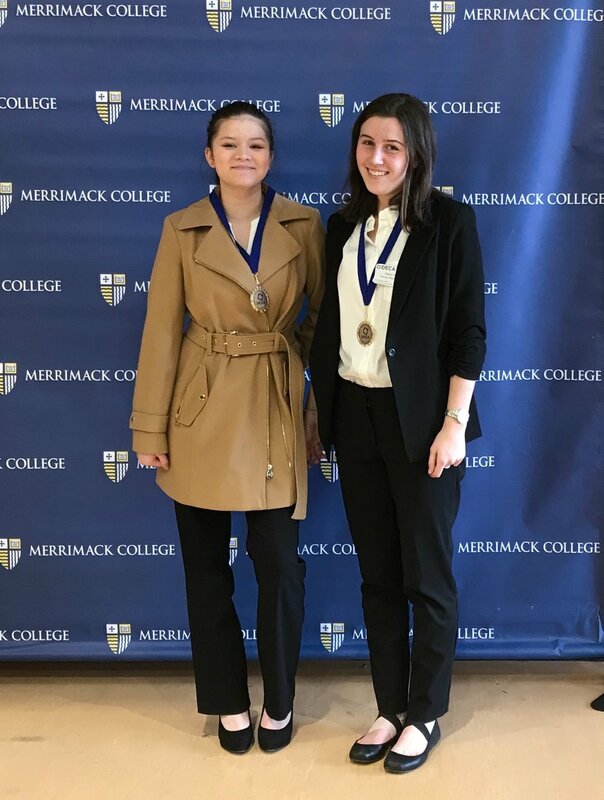 Junior Meghan Jegorow and sophomore Jelena Lopez placed fifth in the category Buying and Merchandising Operations Research Plan and will move on to compete at the state level March 7 - 9 at the Boston Marriott Copley Hotel & Hynes Convention Center. In addition, seniors Nick Nahid, Liam Healy, Angela Spaulding, and Korin Griffin. will compete in Quiz Bowl, a game-show style event where they will be quizzed on DECA knowledge. At the district competition, senior Josmell Ramos Baez placed third in Personal Financial Literacy, and two freshmen, Olivia DeLisle and Abigail Szarek, competed for the first time after learning about DECA and business at their middle schools. Get your name in our Spring Musical program!